The more I talk to Barefoot runners, the more I understand that barefoot running is more of a religion than a science. Barefoot runners say – they regret wearing shoes for whatever time they did. Makes me wonder, what am I missing out on running with shoes! Coming back to the series on Barefoot Running in India on WellthyFit, click here to read about long distance barefoot running here. Click here to read about how to start and pros and cons of barefoot running. This third article in the series is on and by Jitendra Tayde. I did a phone call with Jitendra and was convinced that his barefoot running story is great for people who want to make a slow, gradual and even unintentional transitioning to barefoot running. Jitendra Tayde, 50, a civil engineer by profession, born and bought up in Mumbai, now lives in Vasant Vihar, Thane. Upvan Lake, Yeoor Hills is where he runs. His current running group is Upvan Runners. A new job compelled him to shift to Delhi in september 2015, where he ran mostly alone and sometimes with a fabulous group of Delhi Runners (DRG). Ran HM at the inaugural Millennium City Marathon (Gurgaon), ADHM 2015 and team event at the 12 hour run (2016) JN stadium. The times clocked 1:38 and 1:36 respectively at the HM events showed that he had attained my normal fitness, after he suffered from an injury for a long period. He got back from Delhi to Thane (Mumbai) in early 2016. Few notable runs since returning home are as follows. On insistence of wellness committee at my office I registered for my 1st Half Marathon at SCMM 2012. I always considered myself fitter than others at our office. However, after beginning the training in Oct 2011, I soon realized that I was unable to run more than 3 km at a go. Systematically I increased the mileage to prepare for the distance. As I stood in the huge gathering of runners at the holding area, excited about the 1st Mumbai Marathon, my goal was simple- to run nonstop and without cramping. I managed to complete the HM at SCMM 2012 in 2:01 hours. Running remained a random, unstructured and irregular activity through 2012 until I surprised myself with a time of 1:50 for the HM at SCMM 2013. The improvement was enough to get me hooked on to running. I always liked being minimal. One fine morning in Sep 2013, as I was putting on my running shoes, I found that sole of one of the shoes had come off at the toe. Without second thought I decided to run bare foot for the day and ran 5 k as planned – felt no pain, no blisters. The feel running barefoot was good, better than running in shoes. During 2013-14, finding time for running in the hectic routine of travelling and working, along with other chores of life seemed a task. So I took up running in the evenings after work on weekdays. The evening runs of quick 5-6 km used to be with shoes as there were dark stretches where the surface was in poor condition and barefoot runs happened on Sundays only. Thus unknowingly the transition to bare feet running happened gradually. The striding and the foot strike pattern too had improved. From striking “heel first” it changed to “mid foot landing”. I gradually started to increase the mileage. It didn’t take long to realize the reason for the seamless transition to barefoot running. As a child and even as an adult, I never wore any footwear while playing in maidans (play grounds); be it game of football, cricket or volleyball. I felt somewhat uncomfortable playing in any kind of footwear. The uneasiness of playing in footwear was probably attributed to being underweight and therefore not feeling the grip with the ground. 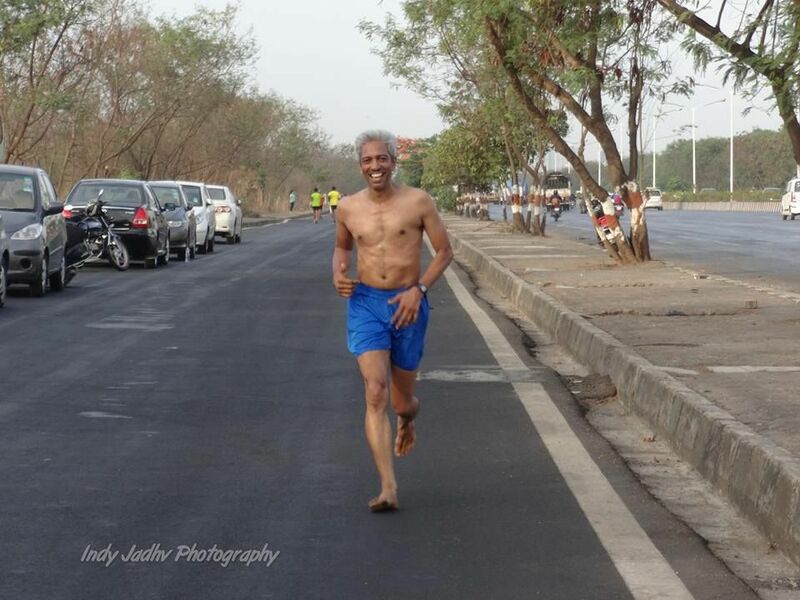 About 2 weeks prior to SCMM 2014 I had run bare feet for about 17 k. However, I hadn’t made up my mind till the very morning of SCMM 2014 as to whether I would run barefeet. As I prepared to leave home in the wee hours I went to the shoe rack, thinking to wear the shoes; but pulling out chappals (slippers) instead of shoes. I guess the choice to go bare feet at that moment must have been euphoria of race day. I had also decided to run without watch or any gadget. The run was smooth. I ran neck to neck with Savio D’souza, the ex-ace of long distance and cross country. Though he must be about 10 years older than me, I was overjoyed to leave him behind at about 9.5 k mark. It was all smiles at the finish line to see sub 100 min on the clock. 1:38:01 it was! An improvement of about 12 min for the distance! Such was the feeling that at the finish that I felt abundant reserves within me for another 10 km. My training continued with renewed vigour. I started running without shoes during all my runs irrespective of evenings or mornings. I ran about 84 k (72 km was bare feet) at the inaugural Mumbai Ultra 2014 (12 hours run), clocked personal best of 1:34 at the Vasai Virar half marathon the same year and was 1st runner up in 45-55 age group at the inaugural (Oct 2014) BNP 25 k.
I suffered a stress fracture to fibula bone of right leg during a fast short run in Apr 2015. The fracture was result of paying no attention to other factors such as nutrition and core and consequent reduction in vitals such as calcium and Vitamin D. Mere walking had become difficult after the fracture. As per the medical advice, I remained away from running for about 4 months. Since registering for SCMM 2018 (FM) I have become systematic in my training, nutrition, stretching and strengthening. In Mumbai where there are no grounds or parks to run, the bare foot running on hard surfaces such as tarmac, concrete obviously involves more impact than the running in shoes. Therefore, to keep away from injuries the schedule of my intense runs is interspaced with non impact exercises such as cycling/swimming. Though my taking up bare foot running was purely incidental. I take inspiration from another fabulous runner and blogger Vishwanathan Jayaraman, the one and only Bobby Thomas for relentless improvement, Vishwajeeth Narvekar for his determination to run a sub four at TMM 2018 after recovering from an heart attack, Satish Gujaran for his comrades runs, besides so many other runners around…the list is just unending! My advice to someone who wish to take up barefoot running is to take it up very gradually. Though I haven’t tried yet, one may use minimal shoes such as vibrams, skinners to start with or even with shoes with thin soles to start your transition. Begin with running on soft surfaces such as dirt roads or on grass. Avoid wearing footwear at home or when you are walking in park. Start running barefoot with small distances. Believe me it’s no big deal! It’s all about getting used to and giving time to your body to get accustomed to. The form with which I ended last season, sub 90 min for HM during 2018 seems achievable. I also look forward to the coming season to go under 40 min for 10 k and to have my first run at the tough and famous Satara Hill Marathon. very nice write up on barefoot.